3 Championships and a 2nd Place! 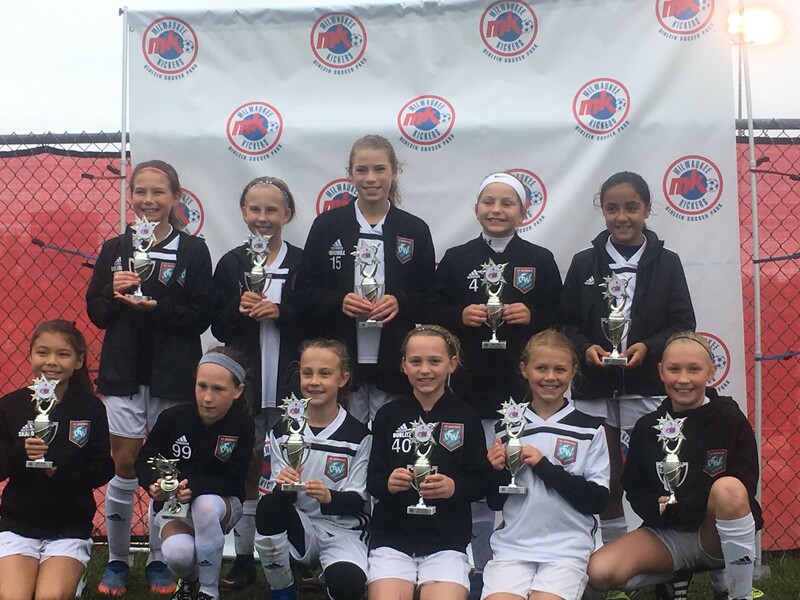 The FC Wisconsin U11 and U12 age groups were dominant in the Pepsi Cup held in Milwaukee the first weekend of October, with three first place finishes and one second place finish. The U12 Black team started the event with a 0-0 tie to the Milwaukee Kickers. “We had tons of chances on goal this first game, but didn’t have the quality to find the back of the net in the shortened 30 minute game," said coach Jacie Lyon. "The girls were disappointed with the tie, knowing that the score didn’t represent the play, but it gave them a sense of urgency in the next two games to find the back of the net early." The second game for the U12 Blacks on Saturday was a 1-0 win against the Madison 56ers, with the goal scored by Cat Arnold. FC WI dominated in possession and play in this game as well, and Kate Vanden Berg, Rhyan Hood, and Payton Haugen defended well to secure a second shutout with Madeline Balz in goal. The final game on Sunday would decide the tournament champion, and the U12’s claimed a tough 1-0 win against ELA from Illinois. Madeline Balz came up with two fantastic saves and a free kick save allowing FC Wisconsin to keep the 1-0 lead courtesy of Eily Duffy, and ultimately the tournament championship. The U12 White team came out strong in their first 30 minute game against GSC, with Taylor Perkins scoring twice and Emerson Hay rounding out the scoring to make the final 3-0. “I was really impressed with how tenacious the girls were in their first game," said Monica Gonyo. "Knowing that the game was short, they came out with high energy from the backline to the forwards and continued to play our style in an unusual environment.” The team's quality play continued in the second game where forward Taylor Perkins found the back of the net early! The defensive back line of Miley Morgan and Nicole Chace, with Paige Johnson in goal, continued to fight and keep the ball out of the net to get another shutout. The final game on Sunday against FC Green Bay proved to the toughest game for the girls. Taylor Perkins scored to put FC Wisconsin up 1-0. Green Bay managed to get in behind our back line, but Paige Johnson came up with two fantastic saves to keep the score at 1-0. Late in the game, FC Green Bay found the back of the net to tie the game at 1-1, but it wasn’t enough to take first place away from FC Wisconsin. “Even with the wind coming at us, against a team that looked to play direct, our defense was strong and the girls never stopped battling," said Gonyo. "I am proud of how the girls continued to play our style, making smart decisions when the pressure was high.” The U12 White team finished the tournament 2-0-1 to come out on top of their division - marking two division champions in the same event for FC Wisconsin. In game one the U11 White girls came out battling against ELA to get a 1-0 win with a goal from distance from Kylie Lundgren. “Despite the challenges of the shortened games and some having never played on turf the team adjusted very quickly," said coach Chrissy Watson. "We discussed that due to the length of the game we would need to play at speed from the beginning and look for chances to score often and early. It was excellent to see a real team effort defending and how eager they were to look to penetrate right from the start.” Game two ended in a 0-0 tie against FC Green Bay. The players created multiple chances to score but couldn’t find the back of the net that game. Kendall Scadden and Emersyn Simon proved to be strong defenders throughout the tournament. The last game of the event would decide the overall winner, and the girls pulled through with a 1-0 win against McFarland. Mahala Polk kept her team in the game by making two diving saves and Madeline Girga scored the game winner early on which proved to be enough as the U11s won their division. Overall, with 4 teams in the Pepsi Cup at U11 and U12, FC Wisconsin secured 3 division championships and 1 second place finish - but more importantly, the teams played with great style and quality.